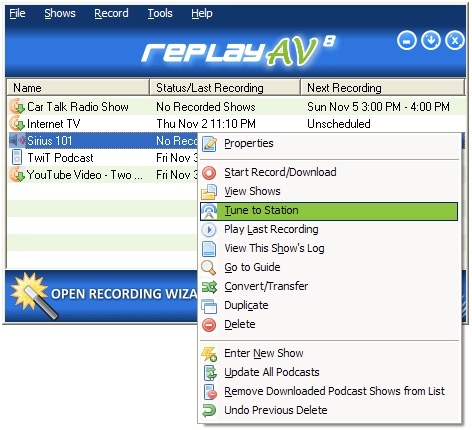 Replay A/V is the most powerful way to capture Streaming Video and Audio, including Radio Shows, Online TV Broadcasts, Video Clips, Audio Archives, and Podcasts. Replay A/V makes it easy to save all types of online media. You can record almost any streaming audio and video instantaneously, or schedule recordings to happen automatically later. Plus, the integrated Replay Media Guide lets you pick Radio Shows, Radio Stations, TV Stations and Podcasts to record with a single click. Replay A/V also captures Sirius and XM Online, too! All the popular formats are supported, including Windows Media™, Real™, Streaming MP3, Flash Animations and Flash Video. Plus, Replay A/V includes an audio recorder that can snag anything you can hear. If you have an iPod or another MP3 Player, Replay A/V has some very handy ways to copy files to your device. For iPods, you can make Audiobook files, which let you make bookmarks in long audio files. All recordings can be automatically copied to any MP3 Player or iTunes. fixed display of multiple "File conversion job will start as a background process" messages when converting multiple files. Improved registration process for upgrades.